I moved to Sarasota, FL in March of 2015 from Boston, MA. 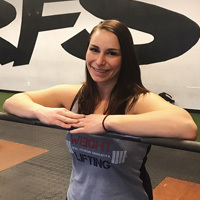 Before moving here, I was an athletic trainer at various High Schools, physical therapy aide, a gymnastics coach and a personal trainer at an all-women’s gym. I graduated from Bridgewater State University with a Bachelor’s degree in Athletic Training in 2011. During my tenure, I competed in collegiate track and field. My specialties included, shot put, discus and the hammer throw, in which I was named ECAC champ in 2010. Growing up I competed and coached both gymnastics and track & field. This has sculpted my passion and affinity for fitness. I thoroughly enjoy helping people and take pride in the knowledge I have gained through both school and experience. I started CrossFit back in August of 2016, and my love for this sport and the community is like no other. I am excited to join the coaching world and look forward to continuing to encourage and educate people on exercise and healthy living.